Polka-Dotty Place: Mint Standard Clothing: Must Have Dress! Mint Standard Clothing: Must Have Dress! I have the best clothing company to tell you about today!! So comfy, flattering, perfect for busy women and they have deep POCKETS! My blogging friend Kelley from LoveLikeCrazy started her own clothing line this year. She's a beautiful, busy, working mama with a great vision for clothing for women on the go. We have been friends for years and I'm so excited to tell you about her new business. You can read all about her mission at Mint Standard Clothing. You're going to be impressed to find out the fabric she's used in her clothing line! She sent me The Cinch - Black and The Shortie - Black with zero strings attached. I couldn't wait to tell you about them. I only share things that I love with you so let me introduce you to these great products!! The dress has the perfect sleeve length, is nice and thick material so it holds it shape really well and it is so comfy. I just feel pretty every time I put it on. I have worn the dress so many different ways this Summer. I'm excited to show you some styling options today. It is the best dress because you can accessorize it however you want. It's so easy to wear! The Shortie is a great pair of shorts WITH A POCKET! I've been wearing them under most of my dresses so I have a place to put my phone/keys. I love this dress and have my eye on The Cinch - Navy/White Stripe next! I'd say The Shorties run a little big so size down. And the sizing on the dresses runs TTS. I wanted to wear my dress multiple times to give you the best review. I've owned it for a couple of weeks and worn it more times than I can count. It's wonderful. In the past I would never have considered wearing a dress while flying, but this one is perfect. It keeps you covered in all the right areas, the pockets are huge for all those travel items and it doesn't wrinkle. It looked great after a day full of sitting and being climbed on by kids!! It's the perfect dress to dress up or down. I wore it grocery shopping and then out to dinner. My son knocked over my full glass of water into my lap. No problem. My I brushed myself off and my dress dried impressively quick. The Cinch is a great, on the go dress. It washes and wears like a dream with ZERO maintenance. No ironing, No wrinkles, No fuss. 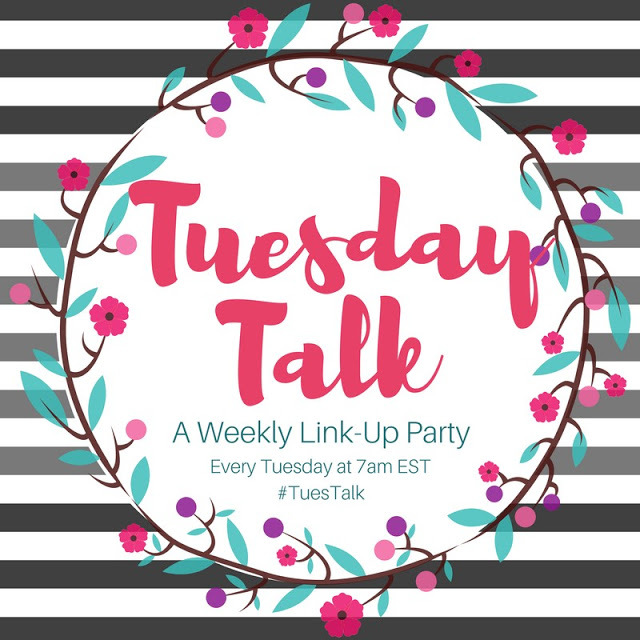 It's time to link up with my favorite Tuesday Talk ladies. Be sure to join us with a current post. That dress is so flattering on you! That looks so great on you. Love it! So cute Whitney. I have voiced my pocket envy already and I really love this style. It is just so versatile and looks super duper comfy. I need to check them out. I am really lovin' the The Original - Grey / White Dot dress. And those shorties would be perfect for when I wear dresses, allowing me to feel covered and confident wearing a dress while running after a toddler. A great black dress like this is a game changer. So versatile! You are so sweet!! I love the way you styled it for early fall!! The denim jacket is adorable!! And Fletcher sounds just like Emma at dinner. Spilling water, ketchup, etc. I love the black bc I can get it a mess and wipe it off for the next adventure, lol. I've already stained the white stripe in my navy haha. You are so sweet to have written an entire post on this!! This dress was made for you, girl! It's the perfect classic LBD. Running to check them out now! I can't wait to check out this dress!!!!! Absolutely 100% my style. Thanks for sharing! Looks like the perfect, versatile dress! I love it styled with the scarves, so cute! So cute! I find that dresses are often the most practical choice for busy days - especially one like that where it's so versatile! Love it! I may have to check this out.